Register your card now then you can search for restaurants and see full offer details. Enjoy your favourite dishes for less at the best Indian, Chinese, Thai and Asian restaurants across the UK as often as you like for an entire year. Simply follow these 3 simple steps to get great savings on dining out. Call your restaurant to book a table. Don’t forget to mention your 241 Curry Card! 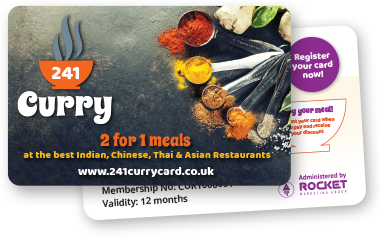 241 Curry Members receive a handy dining Card that entitles them to discounts at hundreds of participating curry restaurants across the United Kingdom. Keep your 241 Curry Card safe as you will be required to present it when you pay for your meal.